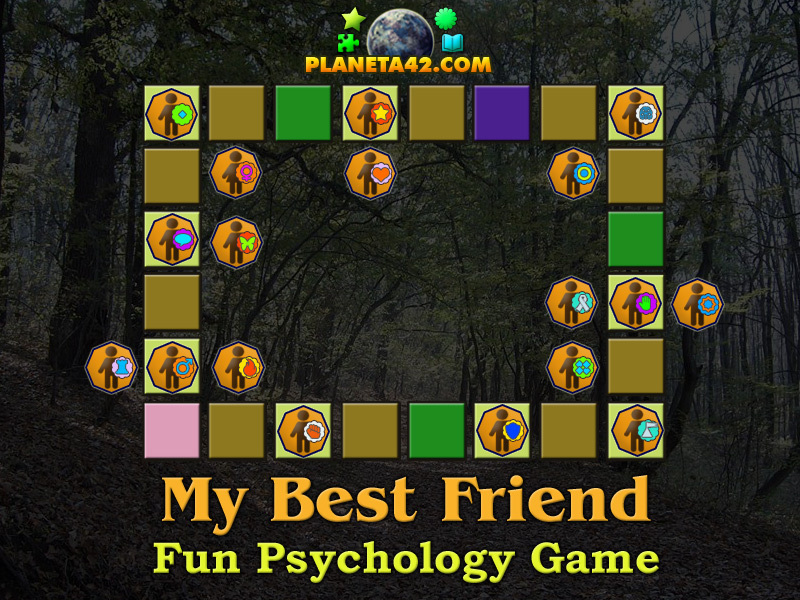 "My Best Friend" is a free online knowledge level game about the personality of a good friend. browser. Click to roll the dice and open all character traits. The Psychology Knowledge Board include 9 pairs of personality traits to define the best friend character. It is part of the Interactive Mind Studies educational tools. Board game. Is a friend in need a friend indeed? Should my best friend be like me? What traits should my best friend have? Who is my biest friend? How to know if someone is a good friend? How to play My Best Friend. There is a 24 square game desk. Click on the dice in the middle to roll a number and then click "go" to move the pawn over the board. Your aim is to visit all squares with question marks and choose one of two traits for your self, which will define one trait for your best friend. But to move, you need food. There are 3 squares which will give +5 food, and if the food is depleted the game ends. Also there is one jail square. Fall on it 3 times and the game ends again. Finally, there are the Jokers. Click on the joker to move just one square forward. This will nullify your current roll. When all 9 traits are set, the game is won and you got your best friend personality traits. To recognize your best friend. Class subject: Best friend personality. It is common belief, that two different characters are more cumulative. But as long as it may work in common aims/purpuses/quests/projects, familiy or love, it will hardly work in friendship for too long. You will need to be confortable with your best friend, and not making too many sacrifaces in this friendship. Your best friend will mostly need to be like you, so he/she will not do what you do not like, because he/she will not like it either. It is true with some exceptions. Can you find the exceptions in the game? 1. The first decision is to define what gender should a best friend be. There are many speculations, that good friends should be with the same gender, but here, it is taken in account with whom, you feel more comfortable, i.e. to talk, express yourself or act freely. 2. The second decision should define the alignment of your best friend. If we take the two extremes, there will be law and order, and chaos and disorder. Either way, your best friend should be the same as your alignment, or there will be always tensions in your relationship. Remember that defining the "bad" is only a matter of perspective, but the ethics refers to the good of those who keep and guard the law, and the bad of those who makes disorder an break laws. 3. The next decision should define the personality of your best friends. There are four types of temperaments, which in term define if the person is more social, or more solitary. Being in facebook for a long time now, it is hardly belived, that people are not social. But some are not. It is a behavioral characteristic, which need to be distributed, so some people should have it. 4. The fourth decision should define if your best friend shoud be more active or more passive in everyday tasking. For example, if you are going for a drink, on a movie or other recreational task (not work), do you like to be called on the phone or you preffer to take the phone and call them all? 5. The fifth question mark should define the attitude of yor best friend. For example, when you have a problem, you like to be advised or be helped. Do not be surprised if some people do not like to be helped. Loners usually like to do their business alone, without any interference. This do not include physical problems, like carrying the wardrobe from one place to another. 6. The next decision should define the initiative of a best friend. It is all connected with leadership. In general, if you like to lead in any given task, sport, or project, your best friend shoud be more following. But sometimes, very rare, two leaders can be good friends, if they do not have the same purposes. The rarity comes from the fact, that people with different aims, have nothing to connect them for too long. 7. The seventh question mark should define the intuition, or how he/she react, when meeting strangers. If cold and distant, or warm and trustful. In general you both need to have the same sense of intuition, or there may be tensions when some of you make a mistake judging the new character. 8. The seventh decision define the political view of the friend. We are not diving in politics in this class, as it is much more complicated, so there are the only two basic characteristics for a political vew - liberal, who are more open to the new and change, and conservative who like the old ways. Believe it or not, you will never really be a best friend with a person with much different political sense than yours, but you may be good friends though. There are always hypocrites of course. 9. The last decision should define if you prefer intelectual environment, or a sport environment for your biddings. 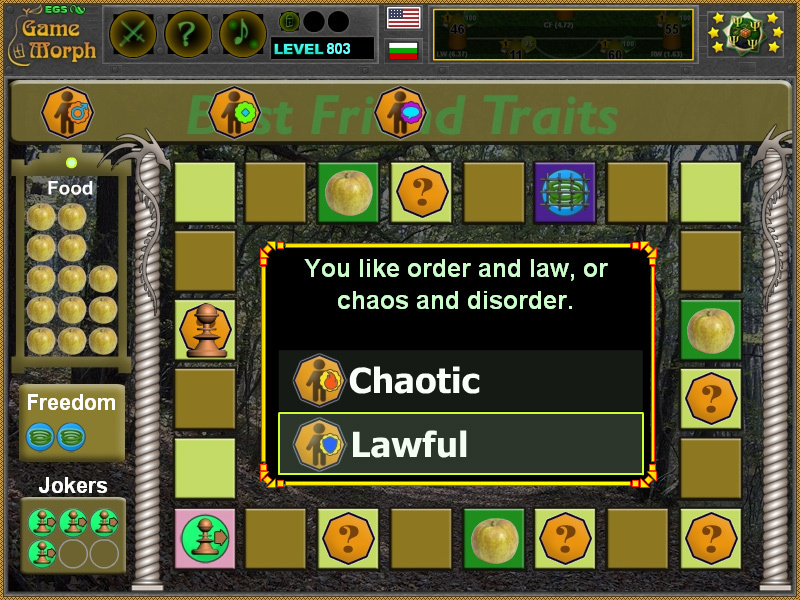 Labels: Mind Games , Board Games , Flash Games , Psychology Games , Education Games , Free Online Games.